The object of CrossRoads is deceptively simple: you must keep traffic flowing through a busy network of streets and intersections. If only commuting were so easy. Better pop those balloons early before they obscure your view of the streets. CrossRoads by Fabulapps is very similar to other line drawing games where you must draw the path of objects to get them to their proper destination. This time the objects are cars, and the paths are confined to a network of streets. With no freedom to draw arbitrary paths, the game is simplified yet at the same time made more difficult. The streets only allow the passage of only one vehicle at a time so you’ll find yourself turning cars around and plotting new routes to hold off the inevitable head-on collision. 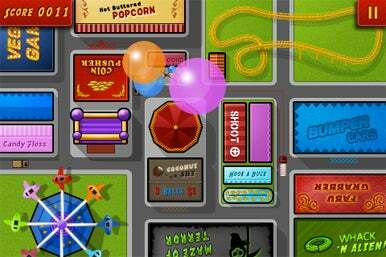 The game comes with four colorfully drawn maps with the option to add more through in-game purchases. The streets are narrow, and the vehicles are very small. Combined with feint path indicators, this could make it extra challenging for gamers with older eyes. Drawing routes is easy with a quick drag of your finger and reversing directions requires a simple tap. The interactive distractions provide for a little variety forcing you to shake clouds away or pop rising balloons. Multiplayer via WiFi or Bluetooth is a nice option to go head-to-head with other CrossRoads players. All in all, CrossRoads is an easy-to-learn and addictive line drawing game. Smart level design, clever interactive elements, and a fun multiplayer mode are the highlights of the game. However, the narrow streets and tiny vehicles might leave you wishing you were playing it on the iPad's bigger format. CrossRoads is compatible with any iPhone, iPod touch or iPad running iPhone OS 3.0 or later.